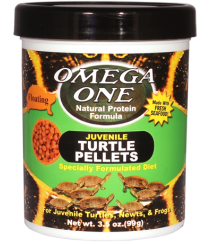 Omega One's small pellets were specifically developed to address the needs of baby and juvenile turtles. A slightly elevated protein level will help your juvenile turtle grow strong and steady. High levels of Omega Fatty Acids, supported by vitamin A, will assist in strengthening the immune system. Whole Salmon, Whole Herring, Black Cod, Wheat Flour, Wheat Gluten, Lecithin, Astaxanthin, Zeaxanthin, L-Ascorbyl-2-Phosphate (Source of Vitamin C), Natural and Artificial Colors, Vitamin A Acetate, Vitamin D3 Supplement, Vitamin E Supplement, Vitamin B12 Supplement, Riboflavin, Niacin, Pantothenic Acid, Folic Acid, Biotin, Inositol, Tocopherol (Preservative), Ethoxyquin (Preservative).